The Jump for Joy Sport range is ideal for aspiring gymnasts (aged 7 to 11 years approx.) working within a more formal approach to skill and physical education goals. 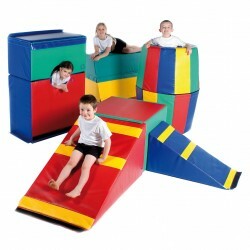 Every item can be used for a specific activity whilst combination of several pieces create variety and challenge. Children can confidently attempt basic gymnastic elements encouraged by the soft support of the sport range or just feel inspired to try all the climbing, sliding and jumping activities their imagination suggests.